Have a question for Sun Cruise Resort and Yacht? "The hotel has wonderful view both from the room and it's surrounding." "My children was very happy staying there, unforgettable moment for us." "Especially, they provide very good observatory located in 9F that can see wonderful sunrise." At Sun Cruise Resort and Yacht, the world’s first on-land premier cruise resort located on a coastal cliff, you can design your own special travel. This resort is home to 211 bedrooms, both condominium and hotel style. 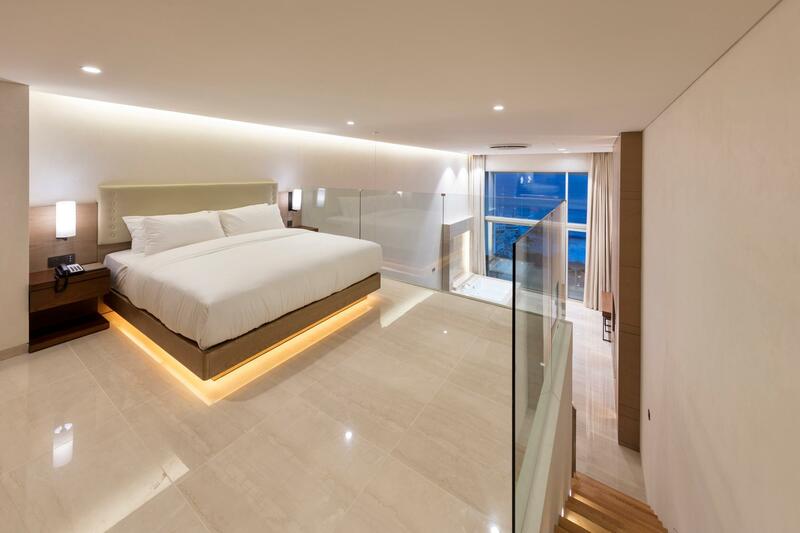 Guests of the hotel can enjoy on-site features like a Western and Korean restaurant, revolving sky lounge, karaoke, a convenience store, souvenir shop, yacht club, and sashimi restaurant located on the edge of a sea wall. This property offers seven state-of-the-art function rooms for seminars and workshops and various marine leisure sports including sailing, parasailing, and kayaking. The scenic walks in the landscaped park adjacent to the resort features a fantastic sunrise and the sounds of waves crashing against the boat. The staff will work with you to make sure you get the best value for your money. 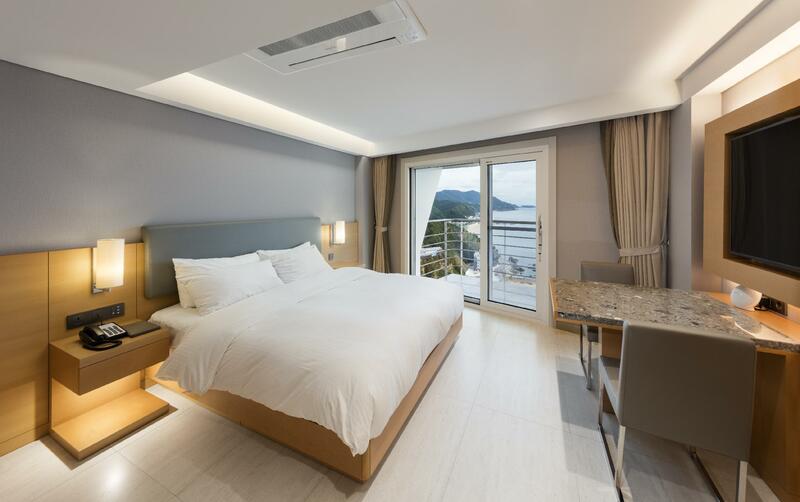 Make Sun Cruise Resort and Yacht your home away from home the next time you travel to Seoul. "This hotel is in an incredible position." The pool opens during the summer months only. Please check with the hotel for pool opening dates. This is a strictly non-smoking property. The property does not accommodate single occupancy in all rooms. The Beach Cruise Infinity Pool is open from July to August of every year. Baby cot can be available after checking the quantity. 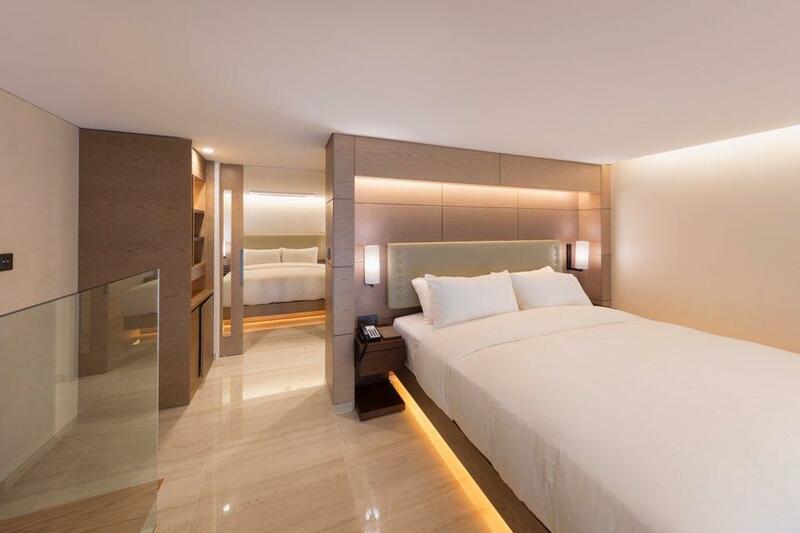 Guests staying in Beach Cruise - Duplex Suite Double Room and ​Beach Cruise - Duplex Suite Twin Room may access the VIP Lounge located on the 20th floor. The lounge is open every Saturday from 03:00 PM to 05:00 PM and the minimum age of guests to enter is 19 years old. The front desk manager was not very friendly. Fortunately, the junior front desk officer help us with our request, I really appreciated the help he has rendered us. It was heartwarming especially in a foreign country. 2 ways to the hotel, either via bus or taxi. Bus frequency about 1 hour. There is always at least 1 taxi queuing outside the hotel. Apart from the above, the room was very spacious. Didn't expect to have a cooking and dining area. we loved the hotel, but it is far away from the train station. most people drove there so I think having your own car is better. we wanted to take a taxi from the train station but there were none available. we didn't know about the city bus so we walked for 30 minutes and climbed the massive hill with our suitcase. other than that, we enjoyed the pool and the beautiful scenery. It was nice view. the staff upgraded our room for free. it was more good. we could see sunrise in the morning. We visited the Sun Cruise Resort and Yacht with a couple of friends to watch the sunrise. The hotel itself was amazing and also a great place to watch the sunrise in the morning. Will definitely visit again and stay there as our stay this time was rather short. Great view with beautiful scriptures garden during sunrise. Restaurant, bar, bakery, grocery and KTV... all you have inside the building. However, the room is quite simple as rating as 3 stars. It would be great for family rather than business. The view from the hotel/room is amazing over the ocean and the beach. The whole area around the hotel, the park, walking path (boochaegil) is really nice. 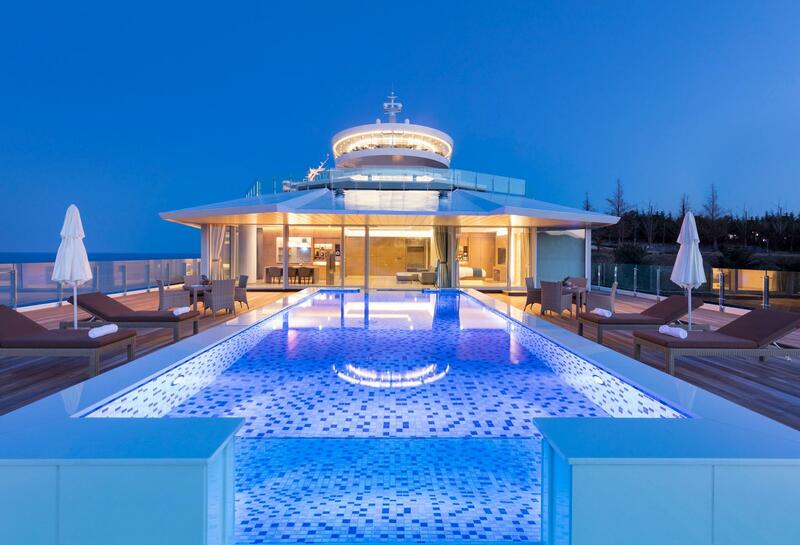 The idea of a hotel shaped as a ship itself is worth staying here! Fun!! Facility has been renovated recently. The ocean view room was worth the high price. I would recommend this to family groups. You can easily find seashore right infront of the hotel, and water is clean that you can snorkel in it. Not that crowded even in the summer, high volume season. One cons is that there is NO good restaurant at all around. The reception did not tell me to get an extra card to go to their private beach. Then i get the master card later, and i paid the 10k as deposit, as they told me that i could get the refund from them after returning the card. However, when i checked out and asked for refund, they said it could only be refunded from the restaurant, which was closed by that time. How come that you cannot tell me at the beginning? Poor service. Mid-October my family stayed in the Beach Cruise in the Oceanfront Terrace Twin Room. Large clean room with table & kitchenette, big bathtub next to patio window that kids played in, spacious patio with patio furniture and beautiful view of the sunrise over the sea. Ate most meals on patio. The kitchenette was new yet disappointing because no tablewear was provided and the burners are not yet operational. Luckily we brought food that could be easily microwaved & stored in the fridge, but wish we had known in advance about the inoperational kitchenette. The advantages to staying at the Beach Cruise instead of the Sun Cruise are beautiful view of the sea and sun rise, the elevator access directly to the beach (no access besides driving or very long walk down from Sun Cruise), the indoor swimming pool (Sun Cruise doesn’t have one), the outdoor infinity pool was still operational, and skywalk access to the Sun Cruise. The coastal hike from Sun Cruise parking lot was gorgeous! Not convenient for travelers without own transport. Suggest to provide shuttle transport to nearby downtown. It has an unique resor that is bulit as a ship. I was fully satisfied with a huge park and lots of facilities. I would strongly recommend this resort if you can book it with a reasonable cost by Agoda Webpage. 1. The appearance of the hotel is gorgeous! 2. The room is spacious and clean! 3. The staffs in reception desk are polite and helpful! Overall is great! It would be better if I could adjust the room temperature by myself. It was really stuffy after the central heating had been on. I had to open the window throughout the night, but that's really not safe! The view of hotel and even the ocean view from room is very good. Beds are very comfirtable. AC in room is not good and service provided in room should be more to say as 5 star hotel stay. Yacht availability should have been updated in website. The standard room was sufficient a little pricey for the quality of the bed but still clean and well stocked. When I was unexpectedly upgraded to the jr suite it was very kind and the room was amazing. Highly recommended for family and the bed was heavenly. One negative but this goes for all hotels here in Korea is that check in is so late and check out is so early so one doesn't get a full day which should be considered with the price you pay. We had a great time, the hotel is immaculate, great location up on the hill so brilliant sea views and sunrises. There is even an alarm 20 mins before so you know when to get up. Just like being on a cruise without the seasickness. All staff extremely helpful and considerate, spoke very good English and took good care of us. When my husbands camera fell over the man running the bakery was very concerned, the next day he asked us again if the camera was ok. Those reviews on here that complain about the walk up or down and the need for a shuttle bus, I understand their point, but we felt it better to support the local economy and use taxis to get around. The revolving bar has good views too, you can order food up there instead of going to the restaurant eg fried chicken or pizza. We also ate in the restaurant, good service and prices as you expect for a nice hotel like this. The supermarket in the basement is packed with all the food and drinks you need for your stay too. The surrounding gardens are well maintained and contain lots of sculptures, so bring your camera! I would go back there again definitely. The hotel is so specially designed, it is so beautiful. 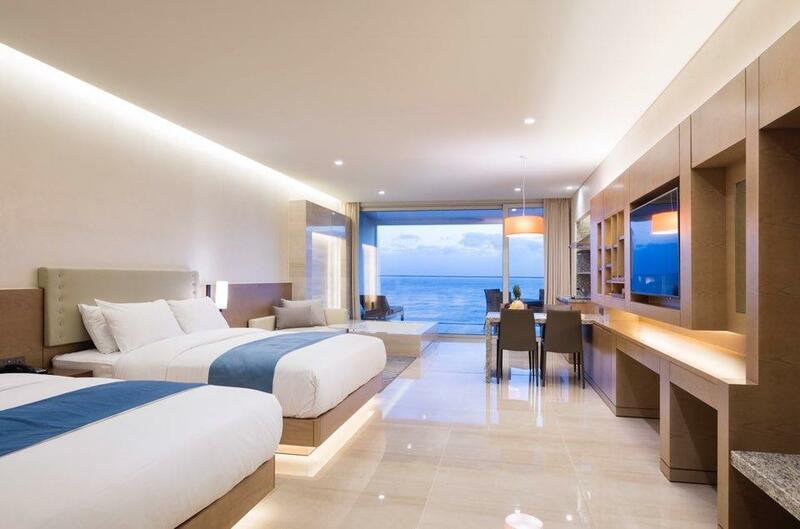 The room is nice and clean and the view from the ocean view room is absolutely amazing! Also there are spots in the hotel park have spectacular ocean view! I really want to go back there!! The breakfast in the hotel restaurant is great and although it is not free but the price is quite cheap! Besides there are lots of fresh seafood restaurant near the hotel, price is so reasonable and the taste so great!